After years of thinking the iconic binary superstar Eta Carinae was unique, astronomers have found five possible twins in other galaxies. With more examples to study, it’s looking good we might someday understand why Eta Carinae exploded so beautifully in the 1840s. 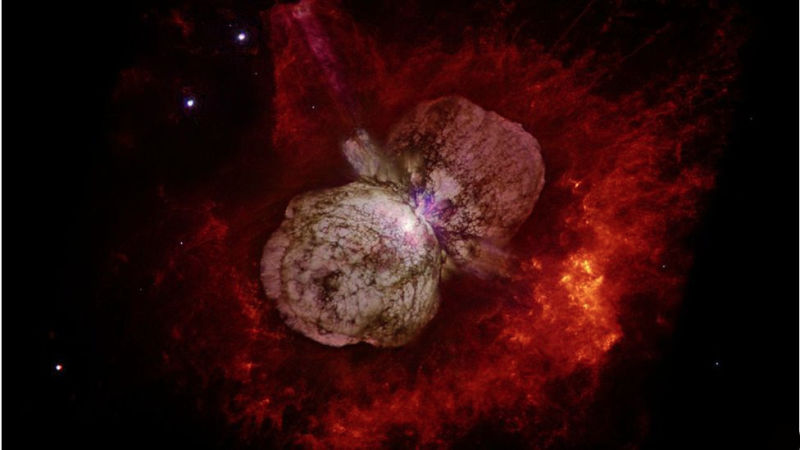 Between 1838 and 1845, the binary stars of Eta Carinae brightened then erupted. The system flung ten to forty times the mass of the Sun into space. The result was the gorgeous Homunculus Nebula, a twin-lobed shell of gas and dust. The still-expanding shroud is unique in our galaxy as far as we know. The system is the brightest and biggest within 10,000 light-years, making it relatively easy to observe. And yet for all our attention to detail, we don’t know exactly what triggered the cataclysmic event. Large stars are inherently rare, and catching a star at just the right moment to watch it explode is even more rare. Astronomers Rubab Khan and George Sonneborn at NASA’s Goddard Space Flight Center and Scott Adams and Christopher Kochanek at Ohio State were convinced they could find more examples if they just looked hard enough. After diving deep into the archives from the Hubble and Spizter space telescopes looking for similar systems, the astronomers found five suspected matches to Eta Carinae scattered in distant galaxies. The trick was to look in both optical and infrared wavelengths. Dust dims the massive stars’ light while re-radiating that energy as heat. This means the team was hunting for stars that were dim in the optical wavelength captured by Hubble, while increasing brightness in infrared as seen by Spitzer. The first survey of searching seven galaxies between 2012 and 2014 was futile, finding nothing in the same class as Eta Carinae. But they uncovered similar less massive, less luminious stars that were still scientifically interesting, although they weren’t the intended target. The second search was more successful. The survey uncovered a candidate twin to Eta Carinae in NGC 6946, M101, and M51, galaxies between 18 and 26 million light-years away. The nearest galaxy also holds the the largest number of potential twins: spiral galaxy M83 is just 15 million light-years away. But we’re going to need to wait to study these possible twins in greater detail. The James Webb Space Telescope will be ten times more powerful than Spitzer, and carries an instrument sensitive in just the right wavelength to catch Eta Carinae’s peak output. Once it launches in 2018, the new space telescope will be able to confirm if any of the suspected twins are echoes of the iconic pair.